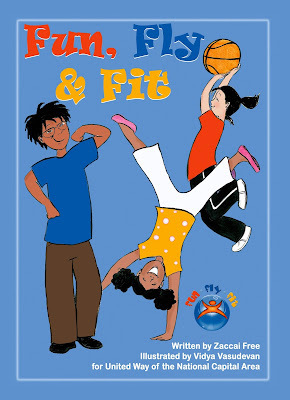 Cover of 'Fun, Fly and Fit', illustrated and designed for a book about the importance of healthy eating and exercise for children's improved academic performance, by the United Way of the National Capital Area. I initially considered having the man hold a gun, but decided against that. Here it's a suggestion that he's on his phone. What being evolves from us?? 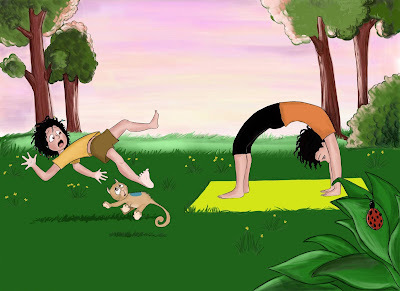 Illustration from 'My Mom Stands On Her Head', written by Robyn Ringgold. 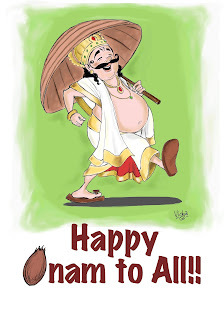 An Onam greeting, made in 2014. Onam is a harvest festival, celebrated in the State of Kerala, India. The character shown is the legendary King Mahabali, whose visit is awaited every year during Onam. I have been illustrating, sketching and cartooning for as long as I remember. I enjoy different forms of illustrating, and I feel not really sticking to any particular style gives me the flexibility to explore. 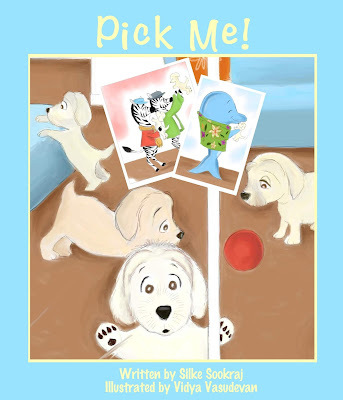 The Children's books I've done, and, proud to say, published are 'Mbutu's Mangos'( written by Zaccai Free), 'My Mom Hugs Trees', 'My Mom Eats Tofu' and 'My Mom Stands On Her Head' (Robyn Ringgold), ' Lizzy Anne's Adventures', 'Rain, Rain, Go Away', 'Will You Be My Friend? '( Sharon Zarrella) and 'Fun Fly Fit'( United Way DC Chapter). Logos, storyboards, T-shirt designs as well as marketing material are other projects I've worked on. I've also been creating custom-made and handmade greeting cards and posters with caricatures, which is something I have been doing for family and friends ever since I was a child. I love every moment of bringing other's ideas and scripts to visual life, and I'm in the process of writing and illustrating a children's book of my own.